Dual Winner -- 2016 Nautilus Gold Award (Women) and Silver Award (Business & Leadership). Women comprise 51 percent of the world's population, make up over half the workforce, and control 85 percent of consumer decisions. Never before have women been so degreed or so represented as decision makers in all areas of influence. Why, then, do we still feel as if success eludes us? Why do we sometimes struggle to keep our drive alive? The linear, heads-down, forward-at-all-cost approach to success that has been forged by men will never take us to the heart of fulfillment. Women are not designed for the straight and narrow path. But until now there hasn't been another choice. Pioneering corporate coach Wendy Wallbridge recognizes this unmet need of professional women for an alternative path to success. Spiraling Upward: The 5 Co-Creative Powers for Women on the Rise offers a cogent, step-by-step roadmap for professional women to unlock their power and achieve success on their own terms. The "Spiral Up" method teaches women to cultivate the five co-creative powers of energy, thoughts, feelings, speech, and action--the fundamentals of self-creation--in order to redefine success and re-author their lives. If you're ready to rise up and express your creativity, authenticity, voice, and power to effect the changes you want, Spiraling Upward will show you the way. Complete with easy-to-follow steps and exercises, as well as inspiring stories of successful women, this book offers a cogent road map for professional women looking to unlock their power and achieve success on their own terms. Wendy Wallbridge is a strategic and intuitive advisor and pioneer in the coaching field. Wendy is the founder and principal of On Your Mark Corporate Coaching, working with Fortune 100 leaders and teams seeking breakthrough outcomes in the face of significant, accelerating change. On Your Mark's clients have included Intel, Hewlett Packard, Apple, ABC-Disney, Wells Fargo, Oracle, Texas Instruments, Symantec, Genentech, Dolby, and McAfee Security, among others. Wendy has taught the principles from her Award winning book Spiraling Upward! The 5 Co-Creative Powers for Women on the Rise for the past decade to groups of entrepreneurs, middle managers, individual contributors, and executives. She speaks at such organizations as Facebook, UC Berkeley Haas School of Business, the Professional Business Women's Conference, The Commonwealth Club, Women in Technology International, The Texas Conference for Women, The Pennsylvania Conference for Women, Watermark and the 3% Conference. Wendy is the producer of TEDxSandHillRdWomen and founder of Women's Evolutionary Leadership Forum. She and her team of coaches deliver leadership programs for men and women at some of the most prominent corporations in the world. Biography Wendy Wallbridge, a pioneer in the coaching field, has earned a reputation for establishing breakthrough conversations that enhance the way women work, live, play, and contribute. Her singular brand of coaching, defined by her Spiral Up! Model, empowers women to become architects of their own lives by following a radically different roadmap to success. 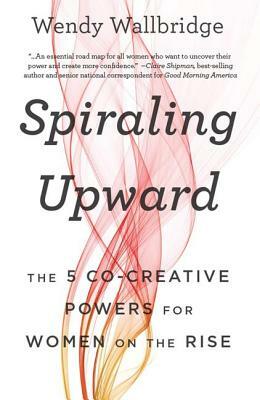 Her book, Spiraling Upward: The 5 Co-Creative Powers for Women on the Rise won the 2016 Gold (Women's category) and Silver (Business & Leadership) Nautilus award. Diagnosed with life-threatening Lupus early in her career, Wendy used that adversity to explore what it means for women live true to our values, feminine wisdom, and unique calling. Wendy is recognized for her groundbreaking coaching techniques that enable women to become leaders and agents of change in the 21st century and to have lives that are more authentic, expansive, and meaningful. A strong and vocal advocate for women, Wendy is the founder of Spiral Up, the Women's Evolutionary Leadership Forum of Silicon Valley, and On Your Mark Corporate Coaching & Consulting, Inc. She is a speaker at venues such as UC Berkeley Haas School of Business, the Professional Business Women's Conference, The Commonwealth Club, and Women In Technology International and TEDx and has been interviewed by Fortune Magazine, Fast Company, the San Francisco Chronicle, The Huffington Post and The New York Times. In addition to being the producer of TEDxSandHillRdWomen, she is on the Advisory Board for TEDxMarin.